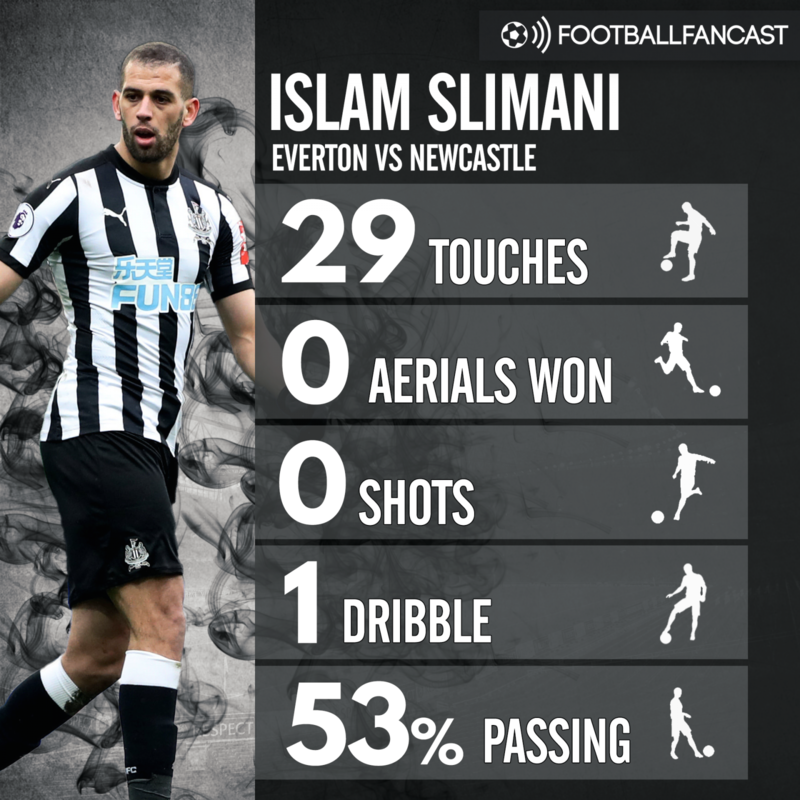 Islam Slimani finally got his chance to impress for Newcastle on Monday night, but the stats suggest he did just the opposite. It was a strange January transfer window for Newcastle. On one hand, the major boost they were hoping for didn’t arrive, as the spending was restricted to loans rather than permanent deals. Despite the underwhelming feeling around the end of the window though, Kenedy and Martin Dubravka have both proved to be huge successes since their moves, and could even earn themselves a permanent future on Tyneside. The one move that really seemed to make zero sense was the striker swap. Aleksandar Mitrovic moved to Fulham, and the Magpies replaced the now red-hot Serbian with Leicester City’s Islam Slimani. Slimani finally got his first start for the club in the 1-0 defeat to Everton on Monday, and things went just about as badly as they possibly could have for the 56-cap Algerian. Slimani touched the ball just 29 times, and didn’t win a single aerial duel, which is one of the main things he was expected to do. The 29 year-old failed to register a single shot, and a 53% passing accuracy just about sums up his performance. To be fair to Slimani, he could have had a golden chance to find his first Newcastle goal if Ayoze Perez had laid on a simple pass in the first half. But nonetheless, he can’t possibly keep his place over Dwight Gayle after Monday’s showing.